Malcolm Henry Luther Culpepper Sheet (Annas Culpepper info) no children. Malcolm Henry Luther Culpepper Sheet (Annas Culpepper info). Malcolm HL Culpepper Sheet (Annas Culpepper info) not on map. Randall Ray Culpepper, Male, died 18 Sep 1992 in Bowie Co., TX. John William Culpepper Family Group Sheet (Frank Rettman info). 1. CHARLES AUGUST RETTMAN He married THERESA. This report is based on information found in "Alive and Good To Know" by Gerald Post and from written interview from William Frank Rettman , Jr. who lives in Sulphur Springs, Texas. 2. ii. WILLIAM JULIAN RETTMAN, b. 1865; d. 1944. 2. WILLIAM JULIAN2 RETTMAN (CHARLES AUGUST1) was born 1865, and died 1944. He married EMMA MARY OKIE. She was born 1871.
i. PAUL LUTHER3 RETTMAN, b. 1891.
ii. CARL ALFRED RETTMAN, b. 1893.
iii. IRVIN W. RETTMAN, b. 1898. 3. iv. WILLIAM FRANK RETTMAN, SR., b. July 23, 1901, Fredonia, Wilson, Kansas; d. March 12, 1966, Pine Forest, Hopkins Co. Texas. v. DATHEL LEONA RETTMAN, b. 1912. James Benjamin Culpepper Sheet (Edna Caldwell & Annie DeVore). Laverne Culpepper, Dau, F, 4 4/12, TX AL AL. Joe N. Culpepper, Dau, F, 4, TX AL TX. Billy M Culpepper, 72, and Alta G Culpepper, 66, divorced on 16 Jul 1984 in Dallas Co., Texas. Original Marriage Date: 23 Aug 1934. Number of Children: 0. Mary E. Culpepper, Hopkins Co., Jan 12 1940, 70037. James Benjamin Culpepper, Male, Widowed, died 9 Apr 1964 in Dallas Co., TX. Billy M Culpepper, Male, died 4 Nov 1984 in Dallas Co., TX. James Billy Culpepper, Male, born __ 1934 in Hopkins Co., Texas, child of Billie Minter Culpepper and Alta Gay Fuller. Gay Frances Culpepper, Female, born __ 1936 in Lubbock Co., Texas, child of Billie Minter Culpepper and Alta Gay Fuller. Obituary* 18 Jun 2005� Lillian Pauline Good, 90, of Corpus Christi, formerly of San Antonio, died Friday, June 17, 2005. She was born Nov. 17, 1914, in Pine Forest, to the late James Benjamin and Mary Dodd Culpepper. She was a civil administrator for the U.S. Air Force. Survivors: daughter, Paula Donley of Liberty, Kan; son, Keith K. Donley of Port Aransas; seven grandchildren; and 6 great-grandchildren. Preceded in death by: husband, Frank B. Good; six siblings; and one grandchild. Obituary of Lillian Pauline Culpepper Good (#23235), published Saturday, 18 Jun 2005. Lillian Pauline Culpepper and Horace Nix Donley are the parents of Paula Jo Donley, Female, born __ 1943 in Dallas Co., Texas. Horace Nix Donley, CCM US NAVY MEXICAN BORDER, WORLD WAR I, WORLD WAR II, Born 15 Jan 1912, Died 2 Mar 1966, Service Start Date: 14 Jun 1942, Service End Date: 31 Oct 1945, Interred 4 Mar 1966 at Section Q Site 54c of Santa Fe National Cemetery, 501 North Guadalupe Street, P. O. Box 88, Santa Fe, NM 87501. Frank Bailey Good died 21 Mar 2000 in Bexar Co., TX. E-mail written Mar 2010 to Warren L. Culpepper from Paula Jo Donley, e-mail address. Jo Nell Culpepper and Harry Cole Young are the parents of Ronald Cole Young, Male, born __ 1948, and Debra Jolene Young, Female, born __ 1954, both in Dallas Co., Texas. 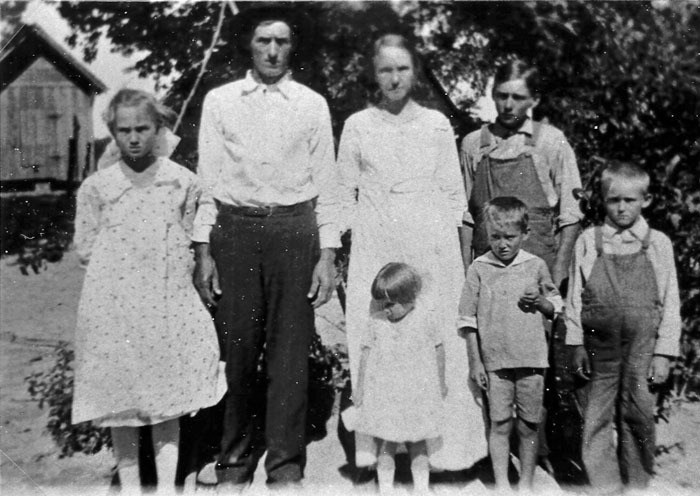 James Edmond Hux Family Group Sheet (Eldora Tedford info).